Interessant ist, das …........... bei seinem Besuch die Null an der Wand fand, Gordon in der mittleren Flucht des Stalles und wir nun in der westlichen. Bei einer Genauigkeit von 6 Metern ist aber alles im möglichen Bereich. Weiter geht unser Tour nach Stonehenge, sicher einem Ziel eines fast jedem durch das Königreich reisenden. 14-Nov-2012 -- From N51-000 we directly drive on in a westward direction and quickly find the farm. We can ask a young man in the small house aside. He calls the farmer who allows us to enter the property. 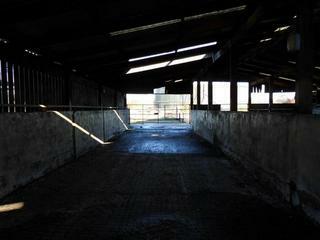 We find the Confluence point in the western part of the barn, which is unused at present. Unfortunately, the zero has changed to 59,9 presumable 1/10 second before we can make the photo. We are very annoyed about it. It is interesting, that ... found the zero point at the wall, Gordon found it in the middle of the barn and we found it now in the western part. But we think that all these results are possible because the accurateness is 6 metres. We continue our trip to Stonehenge, a travel destination of every UK visitor.